Full details of Ancient Egyptian Religion, Death Rituals, Embalmers and Mummification can be found via the sitemap, in the Section called Egyptian Mummies. The following table lists details of the Tomb of Queen Tiye / Akhenaten including its reference number, the date the burial place was discovered and the name and details of the Egyptologist who discovered or excavated the Tomb of Queen Tiye / Akhenaten. The identification of the Tomb of Queen Tiye was originally based on a broken wooden shrine which was dedicated to her and was found in the tomb. Queen Tiye was the chief wife of Amenhotep III and mother of the heretic Pharaoh Akhenaten. It is now believed to be a cache of burial equipment and human remains which were transferred following the abandonment of Amarna, the city built by Akhenaten and dedicated to the Aten. 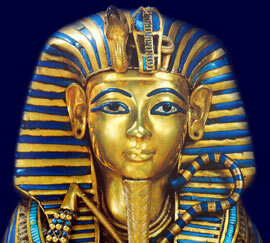 The mummy found in the tomb is now believed to be that of Akhenaten. The tomb is accessed via stairs and consists of corridors and chambers and is undecorated. Theodore M. Davis sponsored Ayrton in this excavation and published an account of it in 1910. Edward Ayrton was the son of a wealthy civil servant William Scrope Ayrton & his wife Ellen Louisa McClatchie. He was educated at St Paul's School in London. During his career Edward Russell Ayrton worked with other eminent Egyptologists including Flinders Petrie and Henri Edouard Naville. The Valley of the Kings is a necropolis. A necropolis is defined as a large cemetery or burial place near the site of a center of an ancient civilization. The Valley of the Kings, where the Tomb of Queen Tiye / Akhenaten was found, is located near the Ancient Egyptian city of Thebes (now modern-day Luxor). There are 63 tombs which have been discovered in the Valley of the Kings belonging to the Pharaohs and leading dignitaries. Many of the tombs were discovered by the Egyptian tomb robbers of antiquity but during the 19th and 20th centuries renewed interest in Egyptology led European Egyptologists, such as Edward Ayrton, to make further excavations in the Valley of the Kings, hoping to find undiscovered tombs, complete with fabulous treasures. Each section on the subject of Egyptian Tombs addresses all topics and provides interesting facts and information about the Golden Age of Pharaohs and of Egypt. The Sitemap provides full details of all of the information and facts provided about the fascinating subject of the Tomb of Queen Tiye / Akhenaten discovered by Edward Ayrton.